Dissolve 65 g sugar with 20 ml of water and boil rapidly in a small open saucepan. When it is a deep golden colour, quickly pour into the base of 3 ramekin dishes. Beat the eggs with the remaining 65 g sugar, milk and vanilla extract. Pour into the dishes. Cover with cling film. Place the 150 ml of water in the bowl with the steam basket. Place the dishes in the steam basket. Steam for 25 minutes. Take out the dishes and chill before serving. 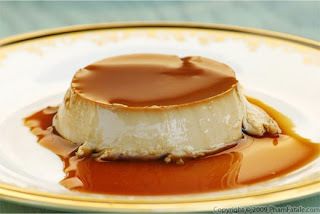 0 Responses to "Cream Caramel"